I decided to make brunch with my dad, so he was in charge of the bacon, and I made the waffles. These didn't turn out as crispy as I had hoped, but that may have been from our waffle maker, and not the batter itself. 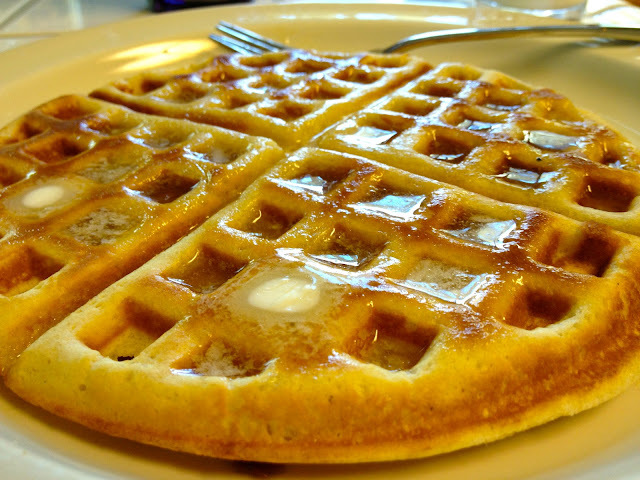 Be sure to butter the waffle maker before ladling the batter in, or else it won't be as tasty! Serve with a mix of butter and real maple syrup! 1. Preheat your waffle iron and brush the grate with butter. Whisk together the flour, baking powder, baking soda, sugar and salt in a medium bowl. 2. Whisk together the eggs, melted butter, milk and lemon juice in a small bowl. Add the wet ingredients to the dry ingredients and mix until just combined. Do not overmix. Set the batter aside at room temperature for 20 minutes. Cook the waffles according the manufacturer's directions until golden brown.